ALABAMA: Roy Moore +8 In New US Senate Poll - Joe.My.God. A wide-ranging poll conducted by an Alabama firm indicates Republican Roy Moore is still holding a strong lead in his Senate race. At the same time, Democrat Doug Jones is polling well enough to show “signs of life” for the Democratic Party in a deeply Republican state, the poll’s memo said. Moore holds an eight-point lead over Jones in the poll released exactly two months before the election. 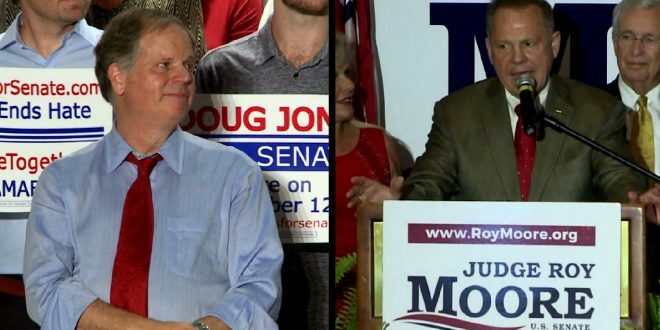 Moore got support from 49 percent of poll participants to Jones’ 41 percent. That’s consistent with two other polls released during the general election campaign that had Moore leading by six and eight points. Name recognition is still an issue for Jones, the poll said. Eighteen percent of poll participants said they had “never heard” of Jones — the former U.S. attorney who successfully prosecuted two men charged in the 1963 church bombing in Birmingham that killed four young girls during the Civil Rights Movement. Moore’s fav/unfav: 52/38 percent. 3 percent never heard of him.